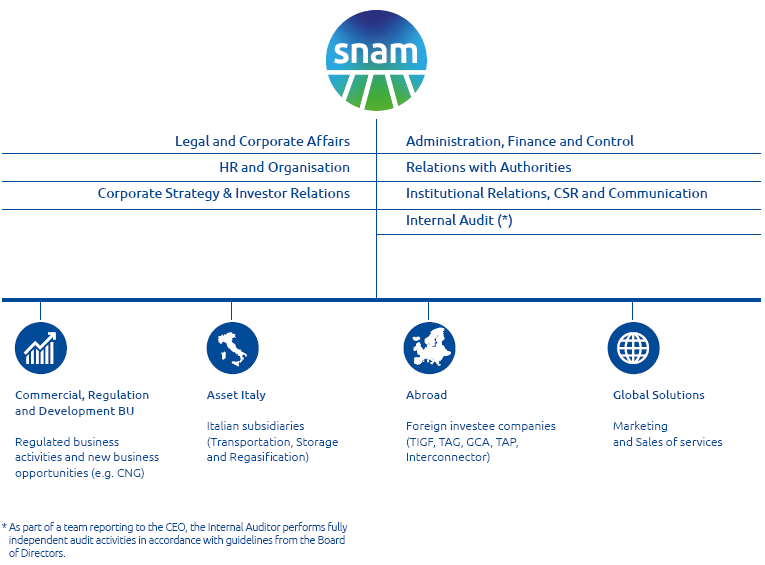 Snam operates within the framework of the Universal Declaration of Human Rights, the fundamental conventions of the ILO and the OECD Guidelines for Multinational Enterprises, and in compliance with its own Code of Ethics, which is also a key element of the Organisational Model of Legislative Decree 231/2001. Snam’s governance plays a crucial role in value creation dynamics. It helps to determine the conditions for the Company to interact properly and adequately with its reference environment, in particular by putting into practice the principles of integrity, transparency and compliance with internal and external rules, with the ultimate aim of reconciling the interests of our various stakeholders. The governance system reflects the ‘traditional’ model and is developed in accordance with applicable industry regulations (laws governing unbundling and listed companies), while also taking into account national and international best practice. Staff functions redesigned with a view to simplifying processes, efficiency and continuous improvement. The objective of Snam’s reorganisation is to optimise transversal processes, enhance specific skills, and create centres of competence. the merger into Snam of the Commercial functions, HSEQ – with the exception of the prevention and protection service – Administration, Budget and Supply Chain of Stogit and LNG. 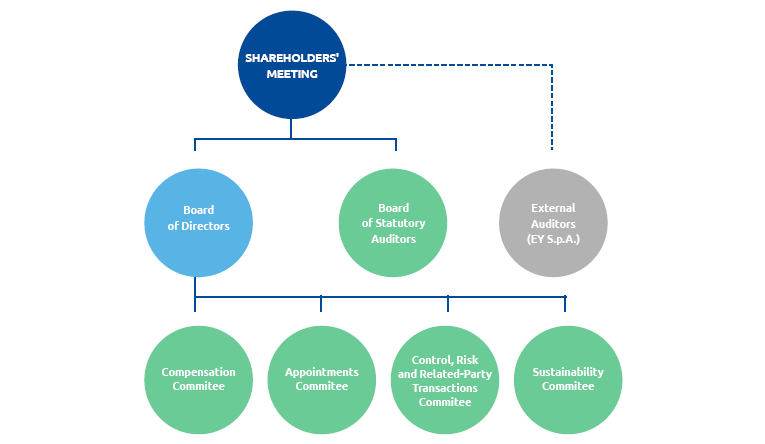 (More detailed information on governance can be found in the document “2017 Report on corporate governance and ownership structure”, which was published online at www.snam.it at the same time as the Annual Report). (More detailed information on remuneration can be found in the document “2018 Remuneration Report”).